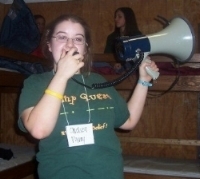 August has been a volunteer with Camp Quest Ohio since 1999. August was the executive director of the Secular Student Alliance from 2001 through 2017. He has served on the boards of the Humanist Community of Central Ohio, the Secular Coalition for American, and PolyColumbus. When he isn't volunteering with Camp Quest Ohio, he manages some rental property and takes care of his mother. Shawn started volunteering with Camp Quest Ohio in 2003 and has been active in planning camp ever since. He has served on the Camp Quest National Board since 2012 and volunteered at Camp Quest Texas (2016) and Camp Quest South Carolina (2013-14). Shawn serves at Director of Leadership Development at Youth At The Center, a nonprofit organization he helped establish dedicated to youth leadership development and diversity, equity, and inlcusion, in Cincinnati, OH. "Anything" Angela has been involved in Camp Quest since 2013 as a counselor, art director, and girls cabin area leader. She lives in Columbus, OH and is getting her second Bachelors degree in Nursing while working as a PSA at Riverside Methodist Hospital. Angela is also a member of a young professionals group at the Godman Guild Association. Stacy has been involved in CQ since summer 2013 in various roles, and is happy to do whatever’s needed. She currently lives in Erie, PA and works as an archaeologist in higher education. Felicisa has been part of the great Camp Quest Ohio since 2017. Felicisa’s daughter Drea has been a camper since the summer of 2016. Felicisa is currently a Community Psychiatric Community Treatment Specialist providing mental health case management to individuals ranging from age 5 to adulthood. Felicisa is also the Chief Executive Officer of Elite Transitional Services llc, a privately owned home health agency; servicing developmental disabilities and the aging. Felicisa has been married for 5 wonderful years and sharing two beautiful daughters Tink (Aundrea) and NuNu (Aubrey), and our family pit-bull Ace. Sebastian has been a volunteer with CQOH since 2017 and has been a CQOH board member since 2019. He has also been a volunteer with CQNW since 2019. He has served as both a cabin leader and as the Humanism Programming leader, and is always looking for ways to help. Sebastian graduated from The Indiana Academy for Science, Mathematics, and Humanities in 2016. He currently lives in Seattle with his cat, Leaf, and works with Community Health Plan of Washington, a not-for-profit that helps people gain healthcare access. McKenna first joined Camp Quest Ohio as a camper and is proud to continue their journey as both a volunteer staff member and board member. Since the summer of 2014, McKenna has volunteered with camp as both a cabin leader and a cabin area leader. They hope to continue to enrich the camp experience year round by serving on the board for CQOH. Kevin is a former camper at Camp Quest. His first summer on staff was in 2003 and he has been a member of the Camp Quest Ohio Board since 2013. Aidan started attending CQ Ohio as a camper in 2012, and has served as a volunteer staff member since 2017. He has also volunteered at CQ Northwest. When not at camp, Aidan is pursuing degrees in Classical Guitar performance and Computer Science at Oberlin College and Conservatory. Rita has volunteered with Camp Quest Ohio since 2013. She has also volunteered at CQ Smoky Mountains and works as a clinical social worker. Chelsea has been involved with CQ Ohio since 1997 as a camper and has served in a variety of roles as an adult. She is a member of the National board and has been involved with many camps across the country. Heather was served on the Camp Quest Ohio Board of Directors since 2016. Heather will be the Camp Director for CQ Ohio's June Session. Caleb began his journey with camp quest in 2008 as a camper, and has loved every second of it. From serving as a lead counselor, a cabin leader, and an assistant camp director, he is always looking for new experiences. Caleb also enjoys spending time with family and is studying Civil Engineering at Rose-Hulman Institute of Technology. Be a vocal advocate of the organization.